Oops. You have been rushing around SO MUCH getting ready for your Halloween party—arranging the snacks, mixing the drinks, hanging the lights, finding the costume— that you forget to make it for your weekly pedicure. What a pain in the T-rex! You had planned to go barefoot, being that you are a cavewoman. After all, you’re all about authenticity. Whatever will you do? Not to worry, cave sister! We are prepped and ready to give you your first prehistoric pedi by means of this pair of Women's Caveman Feet. 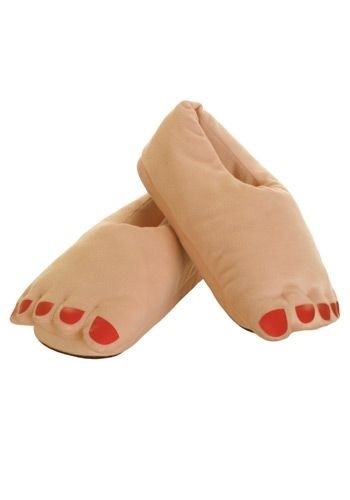 You can feel like history's first foot model and still get everything done in time to don these plush slippers long before your first guest arrives. You’ll likely feel like the belle of Bedrock, and bonus(!) you won’t step into any spills or campfire ashes and have to scrub your feet all day tomorrow to avoid looking like . . . well, like you were raised in a cave. If you're ready to truly go paleo, we have all sorts of fun looks for you! Throw on one of our top-notch animal skin dresses, a bone headband, and maybe get ahold of a club and you'll look like you're ready to tangle with a sabertooth. And you don't even need to give up eating bread! Now, that's the kind of paleo reformation we can handle.